Today: Food52's Assistant Editor Kenzi Wilbur really likes mayonnaise. Here's how she makes it, without a recipe, and with just a few ingredients. So you want to make some mayonnaise. Maybe you're making slap fries, or fancy burgers, or better, you've just roasted a chicken and you're feeling a little decadent. The first step? Don't look at a recipe. All you need is a bowl, a whisk, and a few ingredients we're betting you have on hand already. This isn't the only method out there -- some people use immersion blenders and food processors and blenders -- but we do it by hand, because we're old school, and also because we're too lazy to take out our appliances. Our biceps look better than theirs do, anyway. 1. Put 1 egg yolk into a bowl. 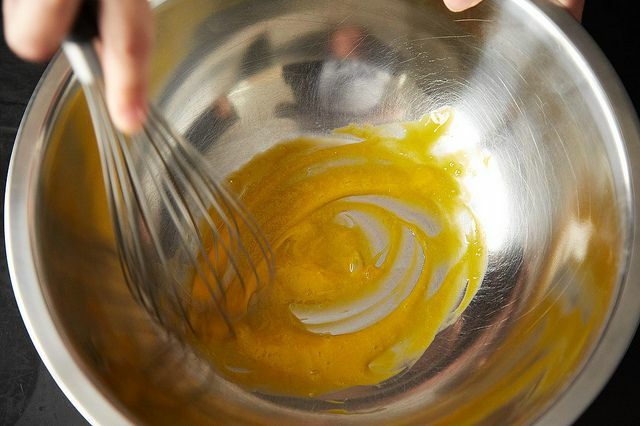 But before you start whisking like a mad person, a bit of science: most think (including food science greats like Ruhlman and McGee) that adding liquid at this stage is essential to properly emulsifying an aioli. 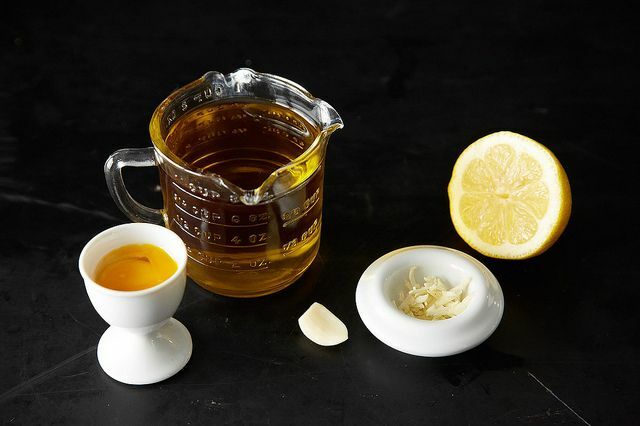 If you're a traditionalist and you'd like a bit of extra security, add about 2 teaspoons of liquid (like lemon juice, water, or a combination of both) now. You can also choose to add your flavorings now, like a minced garlic clove to throw this thing into aioli territory, or a teaspoon of mustard. If you want to go rogue, take a page out of Suzanne Goin's book, and add nothing. As proof this will work, consider exhibits a) this Genius recipe, and b) the fact that when we asked her about it, she said she's been doing it this way for 20 years. Who knew this would be so adventurous? It's a choose-your-own ending aioli. 2. Measure out a cup of neutral oil like grapeseed, and begin whisking it in extremely slowly -- at first, just drop by drop. After about a 1/4 cup of painstakingly. Slow. Adding, the aioli should begin to emulsify. 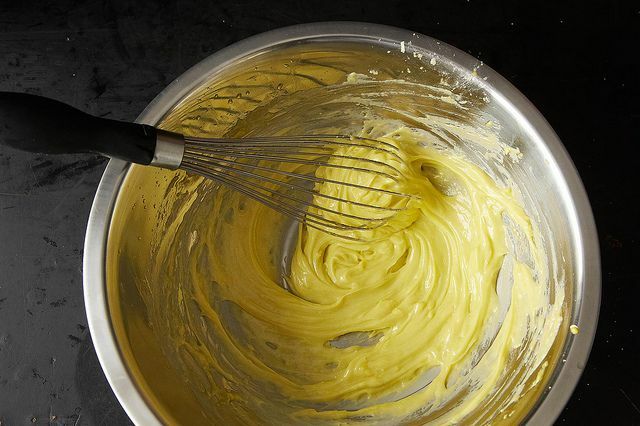 Once it does, you can start adding the oil in a thin stream, still whisking constantly. 3. 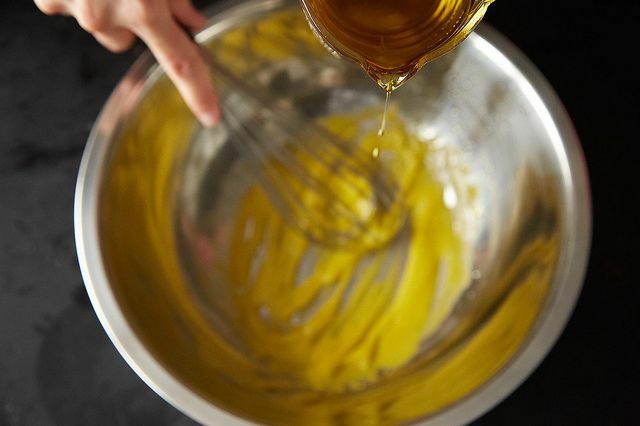 After you whisk in the rest of the oil, your arm will likely be tired. Take a break, and if you haven't added it already, figure out what you'd like to flavor your mayonnaise with. You have options: mash garlic into a paste with salt and stir that in, add some more lemon juice, go wild and fold Sriracha in to taste. At this point, it's your blank canvas. Immersion blender or cuisinart are my choices. The hole in the small pusher in the cuisinart was designed just for making mayonnaise so use it to dribble the oil in. Bacaonaise is my favourite. Made in 1/4 cup batches with liquid and warm but not hot bacon fat (don't want to cook the egg) is nirvana. I made it by hand once -- let's just put it this way: it didn't do my carpal tunnel any favors --but I can say I did it! You could slather this on an old shoe and I'd eat it. You can also make this with an immersion blender in 30 seconds. The only tricky part is you need is a cylindrical container that just fits the immersion blender. However, once you've made it this way, you'll be converted for life. Perfect, painless mayo every time. And it's best with avocado oil, IMO. awesome. I need to try this. and I would like an immersion blender. and cylindrical cotainer. Is it Christmas yet?? A Mason jar is the perfect size. And it really is a 30-second operation at that point. Immersion blenders usually come with a cylindrical container. I use the immersion blender method and it turns out gorgeous and fluffy. what does it look like when it "begins to emulsify"? It'll start to thicken considerably -- and you'll no longer be able to identify singular ingredients. I've only ever made milk mayo (from Food 52), which is so easy. Definitely going to try this soon! Technically, mayonnaise and aioli are not exactly the same thing. If you're eschewing tradition completely, then okay, acknowledge it. Both are easy to do, but not identical. It's true, and you're totally right! We address that in step one when we mention starting with a garlic clove in the mix. I resolve to finally try this!